New-to-market, Step-Safe surface-applied tactile dome warning mats come in yellow, red and grey and are 2-foot by 4-foot, plus other sizes. They are easy to install. Apply with our included, specially formulated, adhesive — no anchors needed. 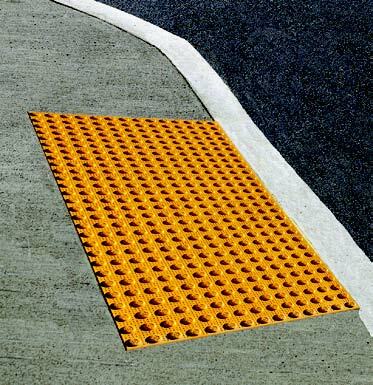 Step-Safe American with Disabilities Act polymer concrete detectable warning tiles have a proven record of strong resistance.